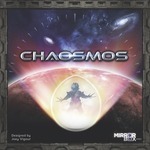 Chaosmos came out thanks to Kickstarter a few months ago and it puts you in the position of an alien race that’s trying to survive the end of the universe. See, all things die and the Universe is not exception. And every creature out there has a survival instinct and aliens are no different. And in this game the Universe is dying and is dying quickly. However not all is lost. There is The Ovoid, a mysterious and powerful artifact that will ensure you can jump straight into the new universe that’s about to be born out of the demise of ours. And yes, you’re going to need it if the civilisation you represent as a player is to survive. Let me tell you, the box is really full of components. From a circular counter to cards, envelopes, small screens to hide things behind, some miniatures, hexagons, cards, tokens… How they’ve managed to get so much stuff in the box is a mystery. How to put everything back in again another. It’ll take a bit of time to get everything together once you’ve played, so be patient. I won’t talk too much about the components because you can see my unboxing video here, which will show you all the components. I’ll only say, just in case you don’t want to watch the video, that the artwork is patchy in its quality and the art direction could be improved somewhat. Setting up time is long to start with, but it’s not too painful. One just has to get to grips with what’s meant to happen for the first time and then it’s a lot easier. However I’d strongly recommend keeping your components well organised to make sure you don’t have to look for what you need when you start your next game. I also have to say the game is easier to play than the rules would make it look. They are quite verbose and long, but the mechanics are rather easy. I’d suggest watching the video tutorials Mirror Box Games has in their website. Seriously, the game is easier than it would appear. The board is set by placing the hexagons with the planets, one for each civilisation and each one of those planets has a small envelope with some cards in them. Those cards are only visible when you get control of the planet and then you can use some of the cars and swapping for cards in your hand. Each player has a hand of 7 cards. The cards contain traps and locks to stop other players to access the envelopes and also equipment, weapons…. And the Ovoid. Each player has a number of actions and they can do one thing during each action. Like going from planet to planet, looking at cards, swapping cards, beating the crap out of each other… That sort of fun! The combat is bloody. Two dice determine the damage, which you can help/deter with some equipment. Nothing to scientific, but fun and tense as you never know how well you’ll do. Eventually time runs out, as in the number of rounds come to an end, and the player who has the Ovoid wins the game. That simple. The rest of the players will look miserably at the winner while their universe collapses and they become nothing while the winner creates a new universe of their own. OK, that was a bit over dramatic. Chaosmos is really good fun. The game starts as a treasure hunt as the players will need to find where the Ovoid is. However they might not want to keep them in their hand right away as some cards can take it away and then start the chase again. Instead the Ovoid can be hidden away. And you have to have a good poker face, or a be a good bluffer and pretend you know – or don’t know – where the precious artifact is. Although the game could have a tighter art direction, it doesn’t really detract from the game experience, so I won’t lambaste the game too much for that. Just something to keep in mind for when the second edition of the game comes out. If you’re blessed to have a group of people like mine to play with, this game is carnage and it doesn’t matter how long it takes, it can be enjoyable. However be careful because the game can be a bit dull to start with if the Ovoid is not found quickly enough. Overall this game is well worth it and it has good replayability value for me. With a bit of luck there will also be some expansions or even a follow-up called Creasmos where the civilisation that jumps into the new universe has to conquer it. One to get out on the table and enjoy around a drink! NextCompetition time: Tell us your worse gaming experience!